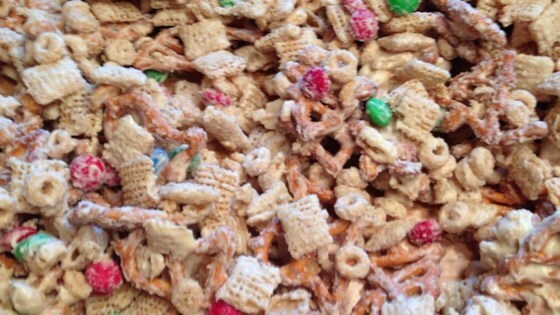 "This snack mix is so addictive, it's known as 'Christmas Crack' among my circle of friends and family! You can choose a holiday mix of M&M's® to make these extra festive!" Cover a large area of counter space with waxed paper and tape it down. Mix pretzels, corn cereal squares, peanuts, and candy-coated milk chocolate pieces together in a large bowl. Melt white chocolate in the top of a double boiler over simmering water, stirring frequently and scraping down the sides with a rubber spatula to avoid scorching. Pour melted white chocolate over pretzel mixture; stir to evenly coat. Quickly transfer mixture to the prepared waxed paper and spread in a thin layer; cool completely. Break into pieces and store in an airtight container. See a great tool for preserving fruits, veggies, meats, even dog treats! Did no one else think the proportions of this recipe were completely off? No one has a bowl big enough for these ingredients. What a mess. This is a great snack mix. One bite and you can't stop eating it! Very addictive. Quick and easy. Makes a lot -- I had to split it up into two large bowls. I used a little bit more white chocolate than called for ... but too much can be overwhelming. Very good, easy and makes quite a lot. Some of the amounts listed didn't jive with ingredients i purchased, but didn't seem to be a problem. Makes nice gifts for friends and family. Took this to work and got many compliments from coworkers. I simply followed the recipe and found it quick and festive. If you're looking for simple and addictive, this is your mix! Super easy to make and really versatile! I've made it several times using different colored candies for different events. Fruity Pebbles make it really festive an yummy too! Totally "Christmas Crack", gave it away with gifts. It was a real hit!